Dynamic Duo - Dear Lizzy & American Crafts + A Give-away! In Septetmber of 2007, I first met my lovely friend, Elizabeth Kartchner, while in Las Vegas as finalists for Creating Keepsakes Scrapbooker of the Year contest. Boy is she ever more than just the Scrapbooker of the Year! She is an inspiring talent, a creative genius, a wonderful wife and mom with a heart of gold. She is Dear Lizzy, indeed. I know I'm gushing, but it's all true... and one would have a hard time not seeing this sweet girl in her new line. 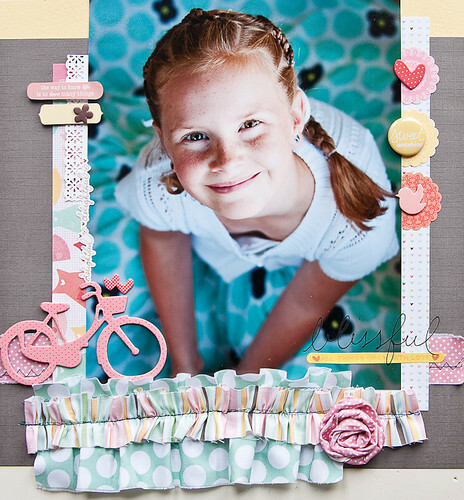 Dear Lizzy is a sweet line of cute girlie goodness with fun embellishments galore. The ribbons are especially fabulous. The pink flower ribbon was my personal favorite. I wish they sold this stuff by the bolt! Then there are the Thickers (alphabet stickers). Ahhh, American Crafts Thickers. Even better still, American Crafts - Dear Lizzy Thickers. Heaven! The elements are happily springy, but most are still versatile enough to use throughout the year. I love, love, loved the adhesive backed fabric paper. They were a great compliment to the line, and have so many uses for making additional embellishments. I made flowers, border strips, ruffled ribbon and no-sew pleats... and that is just scratching the surface of the possibilities. The fabric is backed with adhesive cardstock. You can, however, remove the fabric from the cardstock if you wish. I removed the cardstock backing to make the ruffles, but kept it on for the flowers and the no-sew pleats. 1. The sweet combination of colors and patterns. 2. The amazing coordinating ribbon collection. 3. The ever versatile adhesive backed fabric paper. 1. Some of the Remarks accent stickers were not cut all the way through. I had to snip some of them out to keep from ripping. 2. I would have loved papers with patterns on both sides for more options. (The papers are patterned on the front with coordinating solids on the back. Do you love the sweet whimsy of this line? Have more ideas for the fabric paper? Are you "struggling" through a Thickers addiction, like me? Leave a comment by midnight EST on Thursday to win a prize pack from American Crafts! I love how you used the fabric papers! Used mine to make flowers, but I really like your ruffles! And, Love your love photo, so clever in your layout!! I love the fabric paper! I hope there will be more coming out. Absolutely love this line. I got some of it through the scraproom kit club that I get, including the rosy ribbon. I used all of it up in 1 day I loved it so much. The patterns and colors are perfect. I'm hoping to see more Dear Lizzy in the future. Gorgeous and stunning layouts!!! I have a "big" thickers addiction and absolutely love the Dear Lizzy Line! I have 3 girls so the colours and cute embellishments are perfect for my needs! The flower ribbon is soooo beautiful! I love what you've done with the fabric paper! Sounds like it would be great to use on an altered project as well! Love, love the fabric paper and the little rolled flowers! What a great line. Love your layouts! I also love the pink flower ribbon and that pink bicycle! The Dear Lizzie line is so cute! I love the flower ribbon. I think this collection is more versatile than meets the eye! I used some rubons with some Nikki Sivils (which is also great) and it looked great with it. I just posted it on my blog today! gorgeous projects, noel!! Dear Lizzy, is my absolute favorite line from CHA Winter. You rocked it out! Wow this line is gorgeous!! Love to have some fabric paper!! Thanks for the inspiration and the chance to win!! I love the sweetness of this line - it makes me remember my childhood! You can never have too many Thickers! OMG, I have been wanting this line since I first caught a glimpse of the preview pictures over the winter!!! I need this line. I do suffer from a Thickers addiction, quite literally. I've only been scrapping for a year, and EVERY TIME I purchase something scrappy, I have to buy a pack of Thickers to coordinate. I love everything that AC puts out, but I especially love the Dear Lizzy line from my fave celebrity scrapper Ms. Kartchner! Great layouts with a great product line! Fabric Paper would be great for a Die Cut machine to personalize the front of an album. I love everything Elizabeth Kartchner does, and I love everything AC makes, so I adore this line! I can't wait for the summer collection. I plan to buy everything, like I did with the spring line. And I adore thickers. I wish I had a few packs of each and every one of them. Great layouts...I think the ribbon in this collection in fantastic!!! I totally love this line !! & yes i'm totally 'struggling' with thickers addiction !! 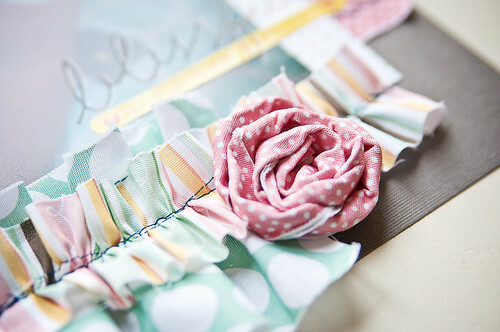 I love those girly look pages especially the use of the fabric flowers. This collection appeared about the time I decreed that I needed no more paper. It is next on my list (esp. the fabric paper) as soon as the fiasco that May ALWAYS seems to be is over and peaceful June appears. Love your layouts! Fabulous line! Thanks for sharing! I absolutely love that line!!! My favourite is that pink patterned paper, the one with all the cherries and strawberries and hearts and stuff! I definetely agree with you that patterns on both sides would be great, as I rarely use the back sides (when i use cardstock, it's almost always white). I love the flower ribbon. Haven't yet found the fabric papers and would love to try them! Thanks for the chance to win. I have been very intriqued by this line and would love to be the lucky winner. I am really into fabric and beautiful ribbons right now and thickers, oh be still my heart. This is a very cute line. I have the crochet flowers but not any of the other parts of the line-at least not yet. I have been resisting a bit because I don't do as many girlie layouts but this would be perfect for LOs of my nieces. This looks like a really fun line to try! Thanks for the chance to win. Noel, what GREAT pages you made with these wonderful products!! You inspire me all the time!! I too have a Thivkers addiction, but I am proud of it:) Thanks for the chance at this amazing giveaway!! I have been drooling over Dear Lizzy since I first laid eyes on it, and you sure rocked it! I need to go to TA for my addiction! (Thickers Annoymous + I need to go back to spelling so I can spell these words correctly - LOL)! Love all of Lizzy's stuff! I love Dear Lizzy! The ribbon is great! I just love this line. It is so sweet and inspiring. I just adore the Dear Lizzy line!!! They are so sweet and perfect for all sorts of projects!!! I am so in love with this line. I have been waiting ever so patiently for my LSS to bring it in but I want it now! I love the fabric paper and the ribbon roses are so lovely! This is all really cute! The trims are my favorite part! dear lizzy is one of my most favorite people in the entire world! I read her blog just about everyday and LOVE everything that she touches! I was so excited when I saw her products! Such great sutff! Sadly, I have only been able to find a few items at my local stores. I'm just dying to get my hands on the rest of it!!! I'm with you on the back-side of the paper. Since AC has cardstock, it'd be nice if the backsides had patterns too. Maybe small monochromatic patterns, for when you want something similar to a solid, but with more interest. Yes, my name is Holly, and I have a Thickers addiction. LOVE the ones that come with this collection! these pages are INCREDIBLY gorgeous - i just can't stop staring! not only is your daughter a great subject and TOTALLY photogenic, but you have the BEST shots! this line is one of my favourites of ALL TIME. i love the combinations, and i have been ITCHING to use the fabric paper and the flowered ribbon. YUMMY! definitely love this line the colors are so yummy! and who is NOT addicted to Thickers raise your hands... hmmm i'm not seeing ONE.. lol! Love your layouts, Noel! The girls are getting so grown up looking! Oh, and I have a huge Thicker addiction but I'm not struggling with it at all. I've completely given in! LOL! I love the new collection of Dear Lizzy, its really so cute, and your layouts are simply AMAZING. Oh, yes, I <3 Dear Lizzy!! Gorgoeus LO!!! I love this line and have been dying to have it. On my wish list for sure! I love fabric paper! I have used it for flowers, ruffles, covering and covering chipboard....so much fun to play with and its also fun to use just like paper....lol. All of the LO's are knockouts!!! I love the composition of every photograph, and what cute subjects the photos have in them. I have a little of the Dear Lizzy line, but none of the fabric paper or Thickers. I would love to make some of the fabric flowers that are so hot right now, and some LO's of my niece would be so "DLC" (Dear Lizzy Cute) with this wonderful giveaway. there is not a thing that I do not LOVE about this line!!!!! It is fantastic. I am SO excited about the fabric paper. WOW! I love the line, but it is a little to feminine for me. I have two boys and usually do more masculine type pages. But, it is beautiful. Layouts are phenomenal!!! I especially love "be the love you wish to see in the world"! These are amazing layouts and photos! I adore the Dear Lizzy line and also suffer from a Thickers addiction!!! I also agree with you about wishing that the papers were double sided, but then again I would need 4X (2 to use and 2 to hoard)as much of it because I love every page of Dear Lizzy! LOL! I love that this line is just plain pretty. I have the same complaint as you, though. I wish the papers were patterned on both sides! These are seriously amazing! WOW! I wasn't in love with this line until I saw what you did with it! Now I need it!!!! I absolutely love this line! The perfect combination of girly and whimsy! Wow - your layouts are STUNNING! Love them all - thanks for sharing - you've completely inspired me to start a project amidst all my packing. I have a deep respect for American Crafts, and they just keep delivering. A very creative line. Can't wait to see more and what people are doing with it. LOVE LOVE LOVE these layouts!!! I don't normally buy "girly" paper, so when all of a sudden I want girly paper, I don't have what I need. I did get a little of this line in my Scraproom kit and I USED it!! Goes to show you, what strikes me as "my style" that I buy vs. what I actually use are not always the same. I'd love to have some more of this line!! Thickers, Thickers EVERYWHERE...I had soo many in my bin that I finally made 2 bins (one for bl/white and second for other colors)...both bins are full again! I feel bin #3 coming on soon! I love the fabric paper that you have used. I am not "struggling" with my Thickers addiction, I wholeheartedly embrace it! Love the fabric paper and your flowers are sooooo cute!!! Thickers are THE one and only letters to use! What a great layout. I love American Crafts products. I LOVE fabric paper and the flowers you can make with it. So innovative and cute! well i have a few pieces from this line already and believe me when i say they are just delightful! i love the entire line and think it would be great for many different kinds of layouts! spring, summer, beach, school, etc. WOW! your layouts are fantastic. Love what you did with the ribbon. I would love to get hold of some of that fabric paper. LOVE your lay-outs!! Love the ruffles and ribbon-gorgeous! looks lovely, would like to try the fabric paper. thanks for sharing! 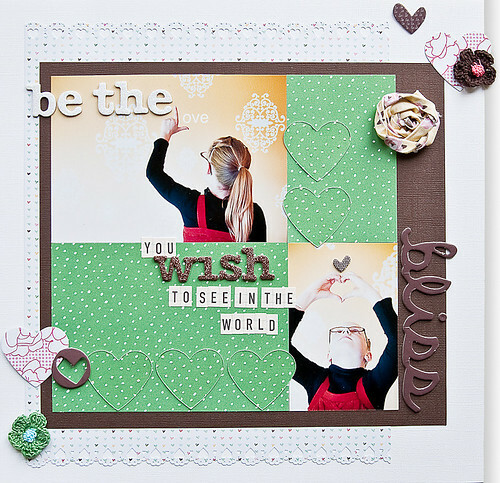 Beautiful layouts - the ribbon is just amazing in this line! What great layouts. Thanks for sharing your creativity. This is a great line of product and I love how Noel has used it here. She is so talented! 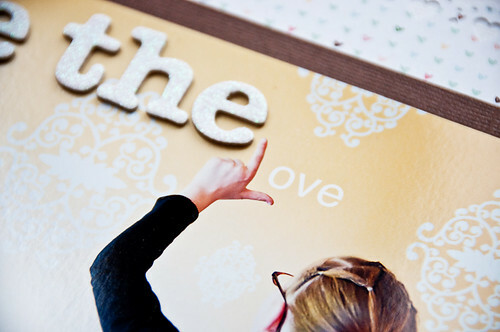 My favorite is the "be the love..." page---inspiring photos and just love everything about it! This collection is so cheery and just screams Spring. I think they did an amazing job with it! Thickers are what I go with 90% of the time, must have more thickers, lol! I love the colors and I am addicted to Thickers. you totally rocked dear lizzy!!!! i want to have these too so i pray i get lucky with the giveaway!!! Everything about Lizzy's collection is amazing...the colors, the accents, the whimsy without going overboard. I just love it! Thickers are my "go-to" alphas. I just love them. Love the Dear Lizzy line as well. I've used the fabric paper with die cuts to make borders. I love this line!!! Your layouts are wonderful. I love the fabric ruffles and flowers!! Definitely have a Thickers addiction and the lastest Dear Lizzy thickers are fabulous. As are your layouts here. I love what you've done w/ the fabric paper. This is one of my favorite lines ever- the colors are delicious and the fabric paper is to die for. I also love the shape thickers that come in different colors and patterns and textures all in one pack!!! Very sweet pages. Love the line. God bless! Great layouts! So girly! Oh, and please add me the the Thickers lovers club. I love your layouts, they are so inspiring! I just received a few sheets of dear lizzy in my kit club and now I want it all! I love the colors and the coordinating embellies and wish I had it all! I should have know, American Crafts never disappoints! Sweet layouts. Not sure about the fabric paper if I would use that. OH MAN!!! WHAT I'D GIVE for this line!! I love it so much. I hope it sticks around long enough for me to scrape together the $$$ to afford THREE OF EVERY LAST BIT OF IT!! LOL! I love the layouts you made with it! They're soooo precious and beautiful! I think the Dear Lizzy line is absolutely inspired. My heart just melted when I saw your lovely daughter with her new glasses! What a beautiful layout!My gorgeously girly 7 year old Georgia also wears glasses as she is extremely short sighted and the gorgeously girly Miss Lizzy line would make a fabulous layout with Georgia in her new purple glasses! love the dear lizzy line!! I love the fabric and the ways you used it!! 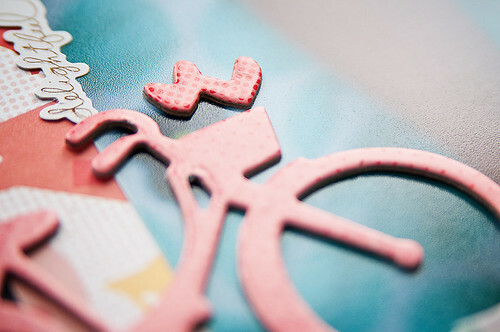 The bicycle is ADORABLE!!! I would love to add this to my "collection". THe review s very informative!! Thanks so much!! FABULOUS line!! In LOVE with eveything. I love reading Elizabeth's blog...never miss it...she truly sounds like an absolute sweetheart! With the new baby coming in November, I'm wondering if her next project may be working on a new baby line?? I'll bet it would be ADORABLE!! Noel your layouts are tooo cute--she's such a beauty!! Thanks for sharing. I bought this entire line! I love it! It was the first lineup I saw in the winter CHA peeks that I said I had to have. I'm loving it up! I love this entire line! My favorite is the fabric and the ribbon!! this collection just looks so gorgeous! I'd love to use it to make some layouts about my adorable nieces! I like the way you used the fabric paper. I should like to try it myself. I'm definately a huge thickers fan! I can't get enough of them! I love the Lizzy line. So cute and whimsical. Love the colors. I am so addicted to Thickers. The letters are so cute. I think everyone fell in love with Dear Lizzie the minute they saw it. It's an absolutely delightful collection. I need to enroll in a 12 step Thickers addiction program! Love the Dear Lizzy line. I love the look of this line, the bright colors. I have never tried Thickers, I hear they are adictive! I haven't tried the adhesive backed fabric yet. I'd love some more ideas and tips for working with it! I do love the girly-girl-ness of this line. Most of my pictures feature my daughter and niece, so we need plenty of girl-girl products! Now don't even get me started on Thickers! I have a pile of layots just waiting for when AC comes out with the "perfect" color, size, texture, and font Thickers for their missing titles! I just love this line & have been dieing to get my hands on it! It reminds me of being a young girl & playing outside all day without a worry in the world. Love the pages you created with it too-so cute! I LOVE AC and THickers are my very favorite!!!! I would love to have fabric paper for flowers!! I love American Crafts products, so the Dear Lizzy collection is another gorgeous addition. I haven't tried that fabric paper yet, but I really want to! I also have quite a collection of thickers. I would have more, but put a few packages back on the rack when I'm shopping so I don't go too overboard. the ribbons are to die for! so beauutiful! love all the pages you did. Your layouts are absolutely stunning. I love how you used the fabric paper. This line is so adorable! I love it all. I LOVE this line. The floral ribbon is GORGEOUS! I have to get some of this! 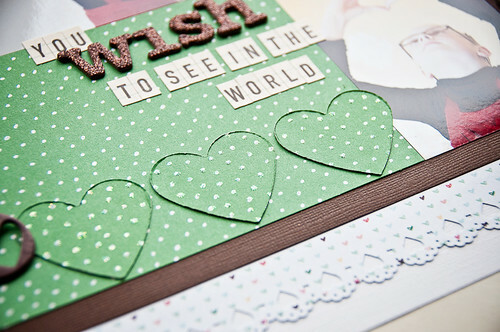 I love the new collection of Dear Lizzy, it's so cute, and your layouts are simply AMAZING!!! This line is beautiful -- I fell in love with it looking at coverage of CHA Winter. It's unique and trendy and seasonal and delicious. So far I have LOVED it. I have had some trouble with the remarks stickers too. I really like the crochet flowers and ruffle ribbon. Love the adhesive fabric paper -serious genius. I wish the stamps were stickier. I love the banner paper and the thickers! Thanks for the great review! I DO love the sweet whimsy! I love Dear Lizzy! Your pages are beautiful! 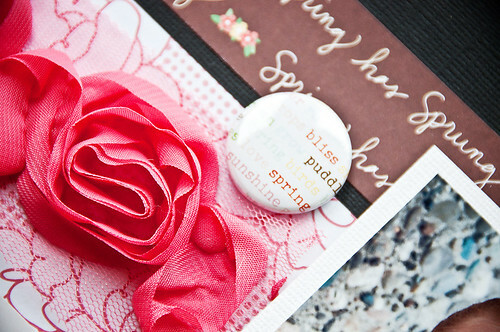 The thickers are amazing...love the handwriting and the pink flower ribbon makes my pages scream girly!!! Love it! I love the dear lizzy line, it was one of my fav cha winter releases. The fabric paper is my favourite and the crochet flowers. I too wish there were double sided pp's. Also there are too many numbers in the thicker packs, I'd make better use of more letters. I LOVE Dear Lizzy! I wish my local Archivers would actually carry the entire paper line! Oh wow, I love the fabric paper! So cool! I love this line! 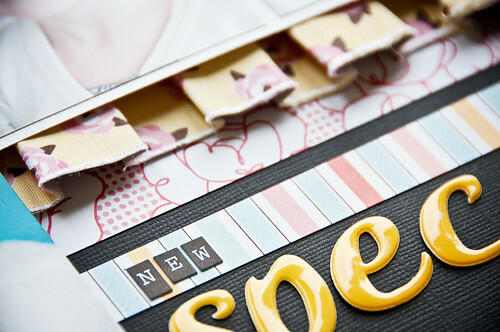 Elizabeth Kartchner is one of my favourite scrapbookers!